One way of routing the carbon canister hoses with a Weber downdraft conversion. Several MGB owners have asked for these photos, so here are a few more pictures of the engine in my 1978 MGB, with an added bonus. 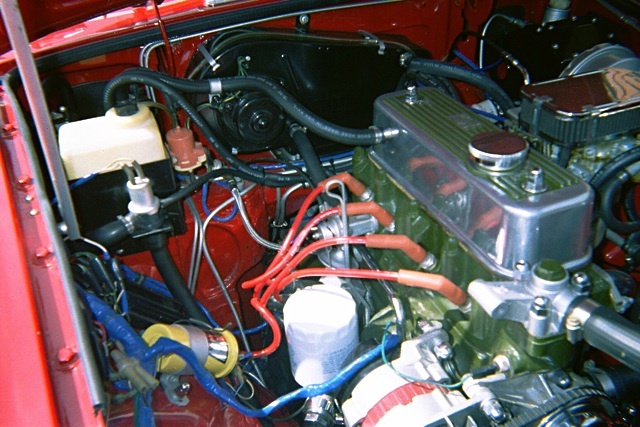 the last photo on this page explains how to route the carbon canister hoses on an MGB that has a Weber downdraft carburetor. Vacuum hose routing for the anti run-on valve is shown too. This photo is larger than it needs to be so you can move it around and get a close look at some of the hose routings. I always make fairly wide curves in my hose routings to be sure they never kink in the curve. Leaving plenty of slack comprised of wide curves between the engine and chassis of the car helps to avoid putting undue strain on the hoses. None of the hoses are near the exhaust header pipes, though they appear to be in this picture. If you didn't know this engine was supposed to have an air pump you'd never suspect it ever had one. The engine actually runs cleaner and gets better gas mileage set up this way than it did with the original Zenith-Stromberg carb, air pump, and cat converter. I filled the air manifold ports with 7/16" bolts, cut & ground them to fit, and peened them with a center punch and small hammer to make them look like the cast iron head material. They are difficult to see even when you are looking at the engine up close and personal. The carbon cannister system does nothing to hinder the performance of the engine. I thought it was important that it be working properly in order to purge gas fumes from the fuel system and allow the engine to breathe freely and cleanly. Here it is boys and girls, what everybody with a weber has been asking about! I colorized the hoses to make them easier to trace. The black hose with a pink stripe goes from the engine breather tube, wherever it may be, to the air cleaner. Your Weber kit will have the air cleaner fitting with it. The red hose goes from the carbon cannister to the air cleaner. I had to make the fitting in the air cleaner for this hose to connect to. The other end goes on the top small cannister hose barb that is above the hose barb on the bottom of the cannister. It takes very little vacuum to make the purge system work and there is plenty inside the air filter. The little yellow hose that is nearly hidden by the red one is the fuel tank vent line and it attaches to the other small hose barb on top of the carbon canister. The rest of the carbon cannister system, may your car have one or two canisters, hooks up exactly as original. The silver-gray hose goes from the rocker arm cover to the large center hose barb of the cannister. With the original rocker arm cover you just hook up the hose, but with an aftermarket cover like this one there is one extra step to take. Aftermarket covers usually have an wide open breather pipe as this one did. In my case, I got a bullet type, (a cup type will do), freeze plug the same size as the pipe, drilled a 3/32" hole in the center, and inserted it into the hose. This is a very simple way to restrict the volume of air drawn through the carbon cannister to the proper ratio. The white hose goes from the anti run-on valve to a port on the intake manifold. 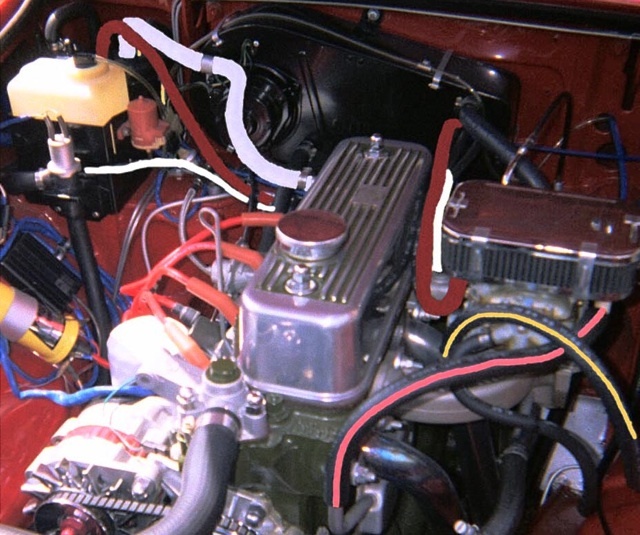 Since the anti run-on valve is closed and no vacuum is drawn through this line while the ignition switch is turned on it makes no difference where on the manifold the line is connected as long as it is below the carburetor. The black hose with the yellow stripe is the power brake booster hose and goes into the front branch of the intake manifold. In the third photo you can see that there is an extra port that has been plugged right near the booster hose connection. That plug came with the weber kit. The vacuum advance hose, which is pretty much hidden in all these photos, attaches to a vacuum port near the bottom of the carburetor on the side next to the rocker cover. Comments on "Weber Hose Routing"
I noted the vacuum advance is connected to the carburator. What model of distributor do you have? I plan on buying a Euro-spec 45D from Brittek for my 1971 GK motor with an alloy head, Vizard V12 cam, headers and Weber 32/36. My old distributor was attached to a port on the stock intake manifold. Should I attach my vacuum advance to the carburater? I notice that the water for the manifold heat appears to be connected to the heater water circuit. If this is the case, as it appears, the manifold water heat will only work when the heater valve is turned ON. 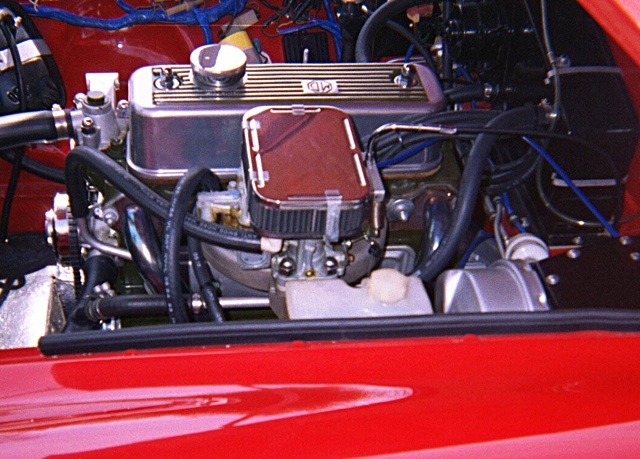 On the Zenith carb, the water inlet is the same but the outlet goes to the top aft port on the engine block. Correct me if I am wrong. I always wonder about Weber vacuum routing because it is ported vacumm and I thought most distributors want vacuum below the throttle plate. I am waiting for a car with original carbs to come in to check to see if the vacuum is ported or the other type. Anyone know? My weber down drafter suffers from run on due to gas bieng drawen out of the carb after the ignition is shut off. Is this because I need to stop the vacume by interducing air under the carb some where, like put a "T" conector in the brake vacume line and hook it to the anti-run-on solinoide? Excellent article! 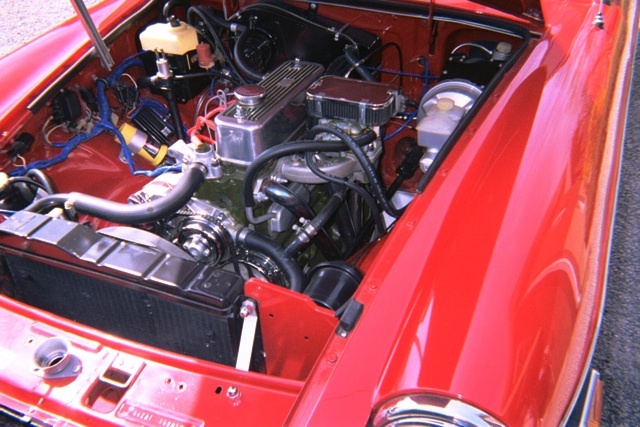 I have studied this carefully after just doing this swap on my 1975 MGB. Every connection is logical except the hose that connects from the bottom of the air cleaner to the carbon canister. On the original setup this connected to the fuel bowl vent(s). Thus, it is a return rather than a vacuum line. Would it not be better to connect this line to the bowl vent on the Weber carb using an aftermarket fitting? do want to do exactly this modifications to the intake and air filter. Could you email a better diagram? the PCV and all appears to be working well. What did you do with the spark advance transmission solenoid . breather tube fitting. Do I need to modify it, or can it be vented els wear ?? I'm switching from a zenith to a weber carb, on my midget and working on re-routing hoses and hooking up the throttle linkage. Will there be other things to switch around? I am replacing the seriously worn SUs on my '72 MGB with a DGV kit. The previous owner had haphazardly removed most of the emissions pieces, leaving a few odd and orphaned bits about. Your article has me on the correct path to getting things considerably more functional. Thanks! Great article. One question: Do you have a better pic or description as to how to connect the vapor line from the charcoal canister to the Weber carb? You said that you had to make a fitting. What did you use and where did you go into the air cleaner? Thanks! Let me answer my own question concerning what I called vacuum connections on the bottom of the Cannon manifold for the DGV. Upon investigating it appears these are actually water connections intended to provide a heat source under the DGV, perhaps to aid in fuel vaporization. It appears to me that this arrangement wouldn't provide ANY heat until the engine was up to temperature. Saw postings on the Cannon website from owners who had disconnected the hoses and saw no difference in performance or starting. Comments/thoughts? I just installed the same set-up (I have the electric choke) on my '79 and Bob from Brit-tek said it wasn't necessary to use that manifold heater connection. I have not had any issue starting or when the engine is at operating temp. Once I dialed in the timing, the Weber performs fantastically.